We are pleased to announce FSA’s 4th Annual S.T.E..A.M. Video Contest. EXCITING TIMES! Once again, we will have a Red Carpets Award Show on Tuesday, April 16, 2019 at 1:45pm with fun activities and surprises to celebrate our student’s skills in different areas of movie making. 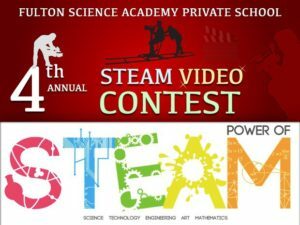 This year we will once again invite video entries with a STEAM (Science, Technology, Engineering, Arts & Math) theme. This broad concept allows students to create their video on a topic that they like. Participants can do anything from exploring a science or math theory/concept to something more charitable in nature that discusses a community need and how it can be addressed. You name it! There is a wide spectrum of opportunities under the umbrella of S.T.E.A.M. Feel free to use any video editing software and upload your finished video to YouTube. Suggested duration of the video is 3 to 5 minutes. Please only use materials recorded by you. This will be a great project for all students in grades four and higher to work on during their Thanksgiving and winter holidays. Therefore, the submission deadline is Sunday, April 7, 2019. Tuesday, April 16 at 1:45 PM. Please CLICK HERE to submit your Youtube video link. Enjoy your time preparing your videos.